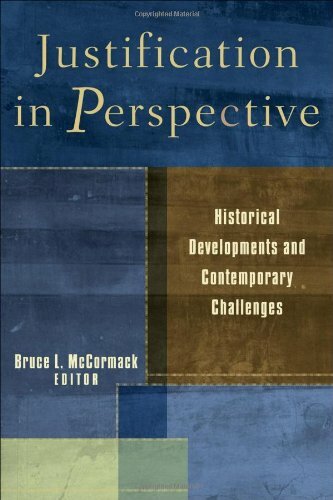 JUSTIFICATION IN PERSPECTIVE: HISTORICAL DEVELOPMENTS AND CONTEMPORARY CHALLENGES. Edited by Bruce L. McCormack. Grand Rapids/Edinburgh: Baker Academic/Rutherford House, 2006. Pp. 277. $24.99, (currently $17.24), ISBN 10:0-8010-3131-1; ISBN: 13: 978-0-8010-3131-1. This collection of 10 papers and a sermon from the tenth Edinburgh Dogmatics Conference(2003) seeks to explicate more fully the Protestant teaching on justification. The papers are gathered into 3 sections: (i) Sermon, (ii) Antecedents and Historical Development, and (iii) Continuities and Discontinuities in Current Challenges to the Traditional View. The volume’s editor, Bruce McCormack, asserts that the function of this collection is to serve as ‘a progress report on the state of the Protestant doctrine of justification today in the midst of challenge and change’ (p. 9). He also confesses that ‘no effort was made to ensure uniformity of perspective’ (ibid). This is, arguably, part of the collection’s strength. That it is offered as something of an ‘in-house’ conversation amongst evangelicals of a Reformed flavour makes the exchange deeper and more exciting, even if narrower in scope. Contributors include Mark Bonnington, Nick Needham, David Wright, Carl Trueman, Karla Wübbenhorst, Anthony Lane, Andrew McGowan, Bruce McCormack, Henri Blocher, Simon Gathercole, and Tom Wright. Some highlights from the menu for this reviewer include Needham’s offering on ‘Justification in the Early Church Fathers’, wherein he convincingly argues that notions of imputed righteousness, penal substitution, and justification through faith alone occur in the fathers. Wübbenhorst’s paper is an impressive reminder of Calvin’s indebtedness to, and critical appropriation of, Luther’s thinking, whilst McGowan helpfully explores the relationship between justification and the ordo salutis, identifying two main streams of ‘union with Christ’ thinking within the Reformed tradition thus reminding us of the tradition’s diversity. McCormack’s paper on Justitia Aliena in Barth is an opulent and timely feast. While not all readers will be convinced, McCormack offers not only a faithful exposition of Barth’s doctrine of justification, but also ample evidence that Barth is one who ought rightly be regarded as standing clearly in the ‘Reformed’ stream. In the final essay, Wright responds provocatively and, at times, scathingly to critics of the ‘New Perspective’ outlining the main tenets of the ‘Perspective’ and clarifying his own position within and against the smorgasbord of ‘Perspectives’. Justification in Perspective makes a worthy contribution alongside recent works by Thomas Oden (The Justification Reader), David Aune (Rereading Paul Together: Protestant and Catholic perspectives on justification, Alister McGrath (Iustitia Dei: A History of the Christian Doctrine of Justification), Tuomo Mannermaa (Christ Present In Faith: Luther’s View Of Justification), and Mark Husbands and Daniel Treier (Justification: What’s at Stake in the Current Debates). While the volume as a whole betrays a dearth of serious exegetical work (a fact that Wright annunciates), it remains a valuable collection from which the undergraduate or informed historian and systematician will glean much. A modified version of this review is to be soon published in Religious Studies Review, after which the definitive version will be available from Blackwell Synergy.